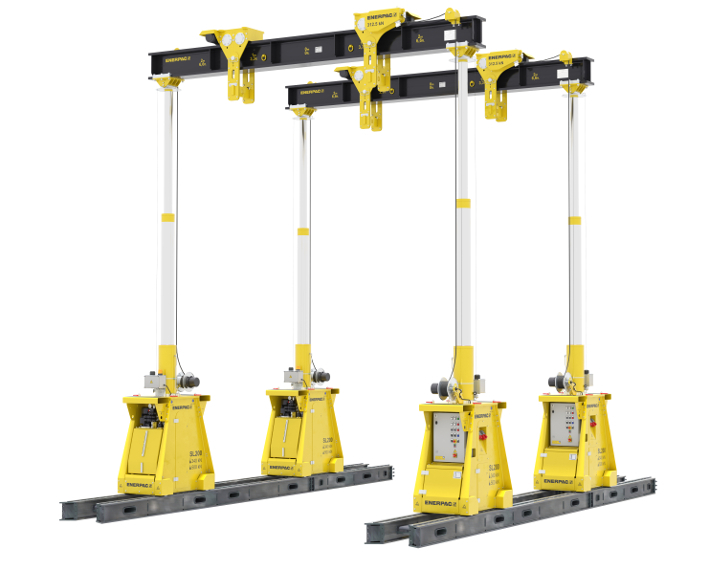 Enerpac is expanding its range of lifting systems for industrial movers and heavy lift contractors with the launch of new trolley and cube jack systems, and telescopic hydraulic gantries, at Bauma 2019 on booth FS 1105/1. The booth will also feature new high tonnage and telescopic cylinders, as well as the growing range of Enerpac industrial tools now available for construction and mining projects. Skidding systems are an important element in many heavy lift projects. The Enerpac Trolley System ETR1250 provides an alternative method with increased benefits over traditional skidding methods. It comprises electrically-driven trolleys which can carry heavy loads along a fixed rail system. Compared with skidding systems, the trolley offers continuous movement allowing for significantly faster travel. The trolley system was successfully deployed on a jack-up vessel for a recent GeoSea Geotechnical & Offshore Solutions project. This involved the movement of 500 ton offshore wind monopile transition pieces some 90m across the ship’s deck to within range of the on-board crane for offshore installation. With the growing success of Enerpac Jacking Systems, Enerpac announces the SCJ50 50T Cube Jack. It is designed to provide an alternative to traditional climbing jack systems and works in a similar way to Enerpac’s current jack-up system but without the necessary electrical controls. The Enerpac SCJ50 Cube Jack offers contractors a safer alternative to jack and pack with wooden cribbing. It also has a significantly smaller footprint, providing heavy lift contractors with a more stable lift up to 2m and where space is restricted. Safe operation is built-in with the self-locking design. Blocks are stacked manually, with a mechanical lock on the up stroke and down stroke. The operation is incremental; at the end of the up stroke the lock will engage. Once engaged the lift cylinder is retracted and another block is safely added. The Enerpac booth will feature the new SL200 Super Lift hydraulic gantry. 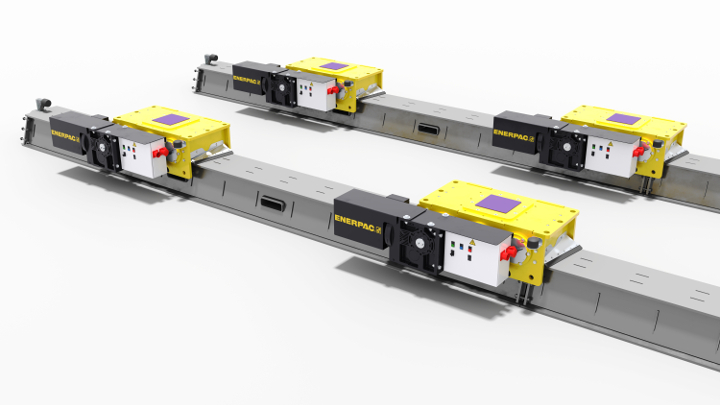 The new Enerpac SL100 and SL200 gantries offer higher lifting capacities and accurate load positioning on a narrow 610mm track gauge. The ideal solution for machinery and industrial moving specialists, the SL100 and SL200 have lift capacities ranging from 100 to 200 ton respectively and feature two stage lift cylinders with a maximum lifting height up to 4.75m / 15ft (SL100) and 6.7m / 22ft (SL200). In addition to its latest high tonnage hydraulic cylinders for loads up to 1000 ton, the Enerpac booth will feature ultra-thin cylinders and multistage cylinders for heavy lifting in confined spaces. For the first time, the Enerpac booth will include new tools designed to complement Enerpac’s bolting range including new flange alignment tools and line boring machines for maintenance work on large mining shovels. Also featured on the Enerpac booth will be the Enerpac Mechanical and Hydraulic Lock-Grip Pullers – an ideal solution for removing shaft-mounted parts on construction and mining equipment. Both mechanical (LGM-Series) and hydraulic (LGH-Series) pullers are offered to for pulling small- to medium-sized wheels, sprockets, bearings and other similar shaft-mounted parts. The puller’s self-centering closing system allows all jaws to move simultaneously, making it easy for a single operator to mount the puller and to perform the application. “Visitors to the Enerpac booth will find an integrated suite of heavy lift and industrial tools designed to handle bolting applications through to the most demanding heavy lift and construction projects,” says Maarten Franken, senior commercial director, Enerpac ESSA. For more information on Enerpac and Heavy Lifting Systems, visit www.enerpac.com.